Give your party food some sparkle with these fabulous picks, ideal for buffet food, canapés and sweet treats. 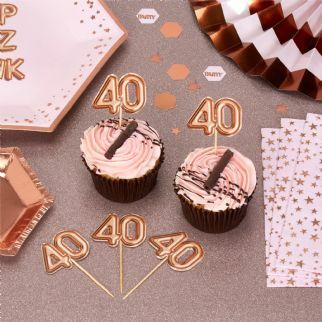 Featuring rose gold 40 numerals, the picks add an extra flourish to your party table and can be used with everything from sandwiches to cupcakes. Part of our Glitz and Glamour collection, the picks can be mixed with other tableware and decorative items to create a dazzling look for your celebration.